Actually, I'll take another 10 martinis. Better send me some tequila shots too just to be safe. Flying - I never used to be so afraid of it. I'm not quite sure when or why it came to be, but if I'm going to be flying, I can't sleep for days before hand. I get so nervous that it completely and utterly exhausts me. Even Gravol doesn't work to knock me out. It's to out of control that I can't even sleep if I know that Mike is flying (which is a lot). I have friends who have gone on to be pilots, I don't know anyone who has been in a plane crash, and I understand that flying is much safer than driving - I just haven't found a way to convince myself that I don't need to stress out so much. It is quite problematic considering that I'd like to make traveling a part of my career. Hmmm... perhaps it's time to figure out how to fix this ridiculousness? 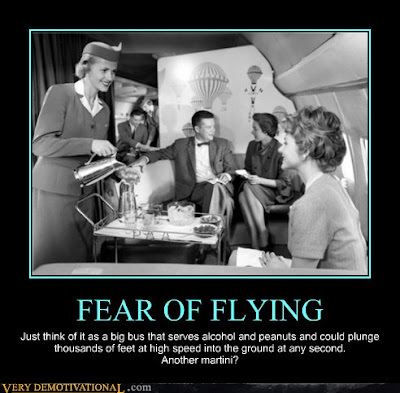 What about you - are you afraid of flying? Is there anything you have done to try to overcome it? Stay tuned for tomorrow when I share my 6 most recent Pins.